Week 2 Newsletter - Bring your bags!! Woohoo! We made it through last week! The first week is always the hardest between last minute sign-ups and making sure everyone figures out where they need to be. To top it off, I had to be in a board meeting last Thursday, so Robert, Mike and the boys took care of the farm pickup. I hope it all went smoothly! If it didn't, holler at me and we'll get everything straight. Now that you all know the drill, I'm going to add a layer of complication for you. Returning members know that last year we attempted to produce a little less waste by asking customers to bring their own bags to pickup to put their produce in. For the farm pickup and the Hillcrest pickup, this worked really smoothly. I set out crates of food and y'all filled your bags. The most successful way to do this was when people brought a few small things to put individual items in (old walmart bags or big tupperware containers) and then something a little bigger to carry the individual items (a cooler, picnic basket, cardboard box). In the event that you forget, I'll have a roll of bags on hand, but I challenge you to make an attempt at zero waste. If you are going to be in a hurry to pick up, or if you happen to be the one person that picks up 5 baskets, just send me a text and I can have your food ready for you when you get here. For those of you that pick up from Julie's house on Tuesdays, we are making an attempt to cut back on plastic for you this year, so start bringing your bags! You will need them this week to take home lettuce and bundles of greens out of the coolers. To take this one step further, my compost challenge from last year still stands if you pickup from the farm. If you think you'd be interested in trying to compost your food scraps from the week but don't have a compost pile in your backyard, you are welcome to dump your compost in our pile. Last year I made this offer but didn't give a lot of guidance with it. The result was that many people tried to bag their compost every day in individual walmart sacks and then brought these sacks to the farm in a garbage bag. Unfortunately for me, that meant that at the end of a long pickup day I spent an hour emptying everyone's individual garbage scraps into the compost pile. It wasn't exactly what I had in mind when I made the offer! So, if you think you want to take me up on this, here is what I would suggest to make your lives, and mine, a little easier. I would pick some type of plastic container with a lid, size appropriate to how much food scrap you have through the week, and dump all of your leftover food in it. Then bring it with you on Thursdays, park at the curve in the driveway, next to the high tunnels and walk behind the tunnels to dump this container into the compost pile. I'll even show you to a hydrant to rinse out your container. Regarding what to put in it, send all of your food scrap. I don't mind meat, dairy, vegetables, cooked or uncooked, eggshells, coffee ground and filters, just no plastic or twist ties or anything else that won't decompose. Ok, to this week's food. As I walked around the farm this evening I realized this might be the first basket we've ever put together that contains entirely leafy greens, no solid vegetables. We are catching the tail end of the early vegetables we grew for market and are a week or two out from the start of our early summer crops. I thought we might see snap peas this week, but the rain and cooler temps have kept them slow. Looking at the forecast, we have several days of sunshine coming up so I have no doubt y'all will see the sugar snap peas in the baskets for week 3. Around the same time we have carrots, beets, cabbage, broccoli, cucumbers and green beans coming soon, but not quite this week. So this basket will have a different variety of lettuce than last week, y'all will each get two (they aren't huge) nice heads of buttercrunch lettuce. This week you will see a different variety of kale, it will either be a dark green, thick leafed dino kale or a curly, thick leafed Siberian kale. Both are nice to make kale chips out of or to chop and saute for any meal. Some of you may see collard greens, some may see broccoli greens (which I cook the same way as collards and actually prefer over all the other braising greens). I expect all of you to see Swiss chard this week-it'll be the bunch with the rainbow colored stems. It's possible that we may see a few strawberries still this week but after all the rain this weekend I'm not expecting much. If greens aren't a staple in your diet and your feeling a little lost, hang in there. The greens aren't around for long and I hope all of you enjoy them while they are here. The internet is a wonderful place to find easy recipes for the more challenging vegetables this week. I think that's all I have tonight. Bring your bags y'all! Remember to let me know if you need to use your skip week. See y'all soon! We have three pickup options this year. You signed up for one when you sent in your membership agreement. That will remain your pickup location through the entire Farmshare. If you don't know which one you signed up for, you need to contact me! I'm going to give three sets of instructions specific to each location. If I have information specific to one group each week, I will always preface it by highlighting that group's name. So don't panic if something I've written doesn't make any sense to you, check to see if the info is meant for a different pickup location! Cool? Ok. So first up this week, on April 25 will be the Tuesday, Little Rock pickup at the home of Julie Majors, 1600 Tarrytown. Her address works in GPS but if you have trouble finding it, holler. My husband, Robert, will be dropping this food off before he goes to work. He comes straight to LR after dropping off at school in Conway in the morning. Barring no traffic accidents on I40 coming into LR, he should always have the food dropped off shortly before 9. If you show up at 9 and he's not there, check iDrive. He will be there rain or shine as long as he's not stuck in a wreck. Your food will be arriving in large coolers that he will set under the tree in Julie's yard. I will send a clipboard with a list of your names on it as well as instructions regarding what you are supposed to take. Please mark next to your name that you have picked up your food. If it is raining, this clipboard will be in one of the coolers so open them up. If you signed up for an Eggshare, your eggs will be there in a cooler, don't forget them! This pickup will be from 9-11 every Tuesday. Robert will come back and pickup these coolers around lunch, so if you don't make it in the 9-11 window the coolers will be gone. Next will be the Thursday Farm pickup. Y'all get to come see me! Your first pick up will be April 27. There are two windows of time that we need you to try to hit for pickup. The morning window is from 9-12 and the afternoon window is from 4-6. I will actually have to leave the farm on Thursdays at 11 to pickup from school, however, our farmhand Mike will be here to cover until I get back. If you need to pick up in between these times, it's not a big deal, just message me and we will make arrangements. If you and I have talked about bringing your food to Conway with me, now's the time to remind me and we'll work it out. Directions to the farm: Our address is 1780 Hwy 64 East, Vilonia. However, it does NOT work well in GPS, please go by my directions! From Conway: Head east on Oak St/Hwy 64. Stay on 64! Don't get off of 64 to go through Vilonia! We live on 64! When you hit the light at the intersection of 64/107 you will be about 5 miles from the farm. When you see Gunter's RV on your left, you are super close and our driveway is just around the next curve in the road and will be on your right. You will pass our first driveway which has a green gate across it and our second driveway will have our mailbox that says 1780. You will see a few large hoophouses and a green metal building. Come to the green building! From Beebe, Cabot, Jax: Make your way to El Paso and head west on Hwy 64. Our driveway is 2 miles from the stop sign in El Paso and will be on your left. You will see the hoophouses and a green metal building. The mailbox says 1780. Finally, the Saturday pickup at the Hillcrest Farmers Market: Your first pick will be April 29 and your pickup will run in conjunction with market hours. For the next two weeks those hours are from 8-noon. After the first week in May the market opens an hour earlier and everything starts at 7. You will come to our market booth and directly behind our market booth I will have a second tent set up specifically for you. I will be there to answer questions but I will have signs on crates of food telling you how much you need to take of each item. While we will be there until noon, I would encourage you to come as early as possible since we have no way to keep your food cold all morning, especially as summer hits. Please text or email me with any questions or if you need to use your skip week! I can't believe it is already time to start writing newsletters! We've had our heads so buried in planting that I haven't thought about much else. I need to start by saying thanks to all of you for taking this ride with us this summer! It's exciting to see so many returning names that have signed up season after season as well as many new names on the list this year as we continue to grow the Farmshare program. This spring has been relatively mild for us and we are leaps and bounds ahead of past years in our planting schedule. I'm excited for the season and ever hopeful for what the spring is going to bring us. Since I tend to get a little bit wordy in these newsletters, I'm going to hit the most important point first. The start date. Returning members are aware that we always target the start of the Farmshare for the first week in May, plus or minus a week. Last year we started a week later while we waited for the sugar snaps to ripen. This year it looks like we will start a week early. Our start date this year will entirely depend on strawberries. We started picking ripe strawberries at the end of last week. So far, not enough of a bowl that any of them make it back to the house before the boys hit them. I expect the bulk of them to hit though in about two weeks. Strawberries are such a rare occurrence on our farm that I absolutely want the Farmshare members to get as many of them as possible. Now if we get nothing but rain the next two weeks, it may push us back to the first week in May, but right now, I'm planning on starting the week of April 24th. I will totally keep y'all posted over the next two weeks though. Beyond strawberries, we have a few other new crops being added to the Farmshare baskets this year that we've never grown before. Based on the survey I gave Farmshare members at the end of last season, we decided to try our hands at potatoes, sweet corn and cauliflower. Cross your fingers! Another change this year is actually due to our sales to the co-op we belong to, New South Produce. Instead of just having head lettuce this summer, we are going to alternate with a bagged lettuce mix. I'm pretty sure most of you would like the convenience of a pre-washed bagged lettuce, so this year we are going to pilot this process and see if it can make sense financially for the farm to offer this. To give a quick overview of how crops are looking around here, we have multiple plantings of broccoli, cabbage, carrots and lettuce that are growing well and right on schedule. Our heirloom tomatoes went into the new high tunnel almost a month ago and are knee high and looking beautiful. With the mild weather we've had, we've actually only had to close the tunnel up two nights since they've been planted. Pretty unbelievable. In our middle tunnel this year I planted Japanese cucumbers that I think y'all are going to love. 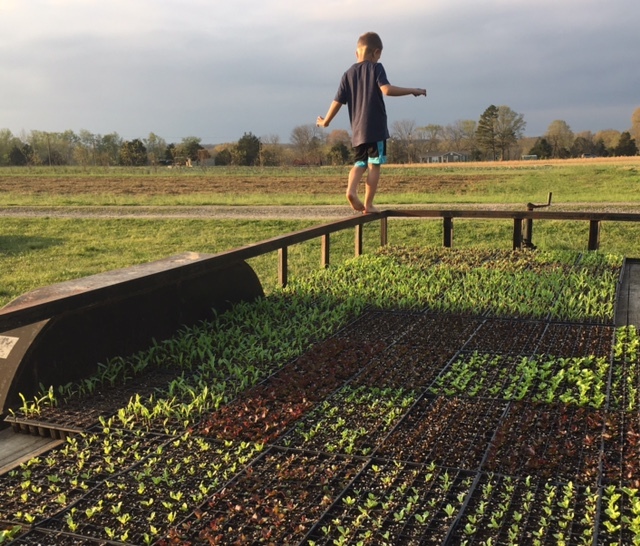 We planted these at the request of the group of restaurants that we work closely with so y'all will reap what is hopefully an abundance as well as see these on your salads at Zaza's in Conway and Little Rock. Our cherry tomatoes are behind this year. Most of you know we've made our name on our orange cherry tomatoes the last eight years. This year when we saw we were going to outgrow our greenhouse space we actually decided to work with an organic nursery in Van Buren to grow our broccoli, cabbage and cherry tomato seedlings. Unfortunately, for whatever reason, the greenhouse manager chose not to plant our 1000 cherry tomato seedlings. And I found this out four days before we were expecting the seedlings to arrive ready to plant. Gulp. Nonetheless, I expedited seeds, cleared out greenhouse space and started our own seedlings. Y'all will still see these cherry tomatoes, just not in May as you have past years. Finally, a little update on farm operations. Many of you will remember Mike, that worked for us last summer. Thanks in no small part to the commitment of our Farmshare members, we were able to keep Mike employed all winter long and he is just as excited about this season as I am. Y'all will see him around all summer. So far we've committed one intern and one more farmhand to start in May and are looking to fill a crew of six for the year. We found out a week ago that the NRCS is offering us another high tunnel this year so construction on that will begin mid-summer. This is really great news for those of you that loved the heirloom tomatoes we produced in last summer in our old tunnel. Having three large high tunnels will allow us to have a three year rotation on tomatoes and keep those heirlooms protected every year from now on. The first construction y'all will see though will be up near the high tunnels and will be a building that doubles as a pumphouse for our irrigation system and a wash station to help increase efficiency in our cleaning process. Allright. I think y'all are almost up to speed! You'll hear from me weekly from now on, typically, late on Sunday evenings. If you know someone that is thinking about signing up, please forward this newsletter to them, it's not too late and we have about 20 spots to fill to hit our goal of 85 members this year. Please feel free to email me (rattlesgarden@yahoo.com) or text me (501-941-0331) with any questions! Thanks y'all!